Please call 0845 0943281 or email if you need a different size or different specifications. all year round play den in the garden. Giving the environment that they need to develop physically and have the peace and privacy so necessary for children today. Fun and physical in good weather, cosy and private in bad weather and through the short winter days and in the dark winter evenings. a good alternative to tree houses, but are a lot easier to put assemble. 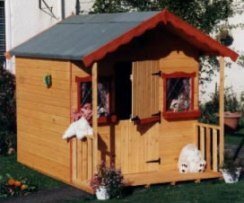 When not in use, wooden childrens play houses also make good storage for bikes or other toys.